Not too often do we get significant snowfalls in the U.S. Southwest, but it was certainly snowy here in late December of 2014. Shown above are the well-named Toadstools hoodoos of Grand Staircase-Escalante National Monument, in southern Utah, capped by several inches of fresh snow. Hoodoos form when relatively hard rock overlays softer, more readily erodible rock. Often, the stem of the toadstool is composed of sandstone or shale. 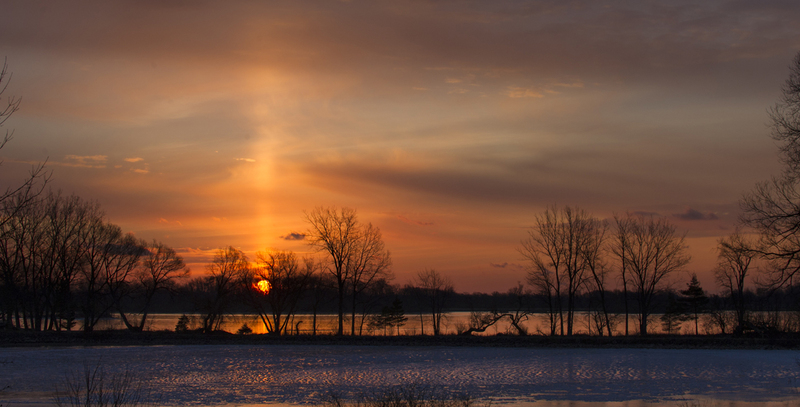 Highlighting this sunset scene is a dramatic Sun pillar, an unexpected surprise! Pillars result when ice crystals in cirrus clouds reflect light from the rising or setting Sun. In order to see the spike effect the crystals must be tipped slightly toward the viewer. Photo taken on January 1, 2015.